[CONFSERVER-25408] 2 Byte characters (Japanese, Korean, Chinese) do not display in Powerpoint macro. - Create and track feature requests for Atlassian products. 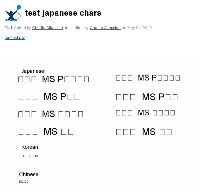 2 Byte characters (Japanese, Korean, Chinese) do not display in Powerpoint macro. If you're running Confluence on Linux based OS, please follow the steps outlined in this KB article. Unfortunately, as of now there's no known workaround for Windows based OS yet. CONFSERVER-16712 [Viewfile macro] Korean or Japanese (probably any multibyte lang) inside of shape in PPT file are broken with viewfile macro. CONFSERVER-25977 Status Macro title is not displayed properly while editing a page. CONFCLOUD-25408 2 Byte characters (Japanese, Korean, Chinese) do not display in Powerpoint macro.